It's a word that contradicts. For better or for worst? Some change to be better individuals. Others change for the wrong god-heaven-only-knows reason. I know for some who change because "something" happened. It's a phase everyone has to go through. But I believe, everyone is aware of their own changes over a period of time. Whether it's a reminder from someone comfortably chummy or someone who can't accept the change. How necessary is it to change? Is it to justify your behaviour? Is it for someone special? Is it for your own good? Is it to please someone? Is it to rebel? Is it to conform? My belief is change for yourself. It will somehow hurt one person. It may or may not be yourself. But as long as it's legit, your conscience is clear, you've got nothing (much) to lose, do it. Every phase we transit into, there's gonna be a sorta change. It's how we deal with it and how we make the best out of the change. 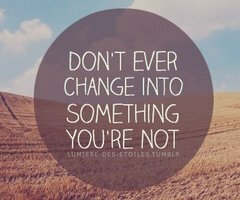 If you change but deep inside, you're hurting like crap, then something's wrong with the change you made. Changes may not be perfect. But it shouldn't hurt. No one should be trapped in their changes. You should gradually feel happy about it. A change of lifestyle, change of diet, change of wardrobe, change of personal self, or even a change of hairstyle can be exciting and people around you who genuinely loves you, will be supportive. However, change of heart, can be a little tricky. Be tactful about it. Look back at 2012 and ask yourself (or your BFF, mom, sister) if there's one thing they could change about you, what would it be? From there, evaluate. Of course, if they truly love and care for you, they will say, "I will love you no matter who or what you are." It can be your temper.. a certain bad habit.. anything. But c'mon, no one is perfect. I need to curb my temper, change my hairstyle (still thinking about it)... and oh, lifestyle. Now that I'm a stay-at-home mom, I actually have the time to do some small changes and do it at my own pace. No point mulling over things within my control. Remember, the choices you make will make a difference in your future.